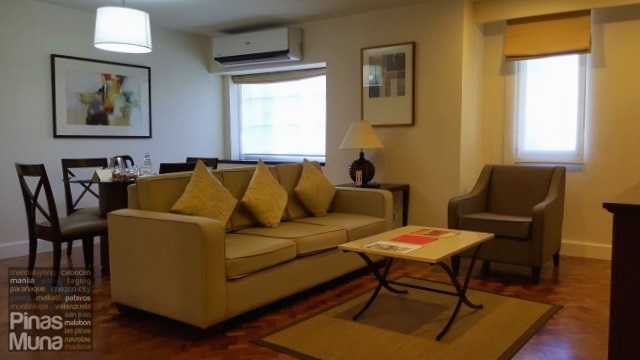 Somerset Olympia Makati is a serviced residence centrally located in the Makati Central Business District, along Makati Avenue and right across the Ayala Triangle Gardens. It features 149 serviced apartments ranging from studios, one-bedroom suites to two-bedroom loft units. Somerset Olympia Makati is managed by The Ascott Limited and caters to business travelers on short- and long-term assignment in Makati. as well as to leisure travelers and staycationers who require privacy and comfort of a home and convenience of a full-service hotel. Somerset Olympia Makati is comprised of four towers, with each tower having its own elevator accessible from the lower ground level. The front office is conveniently located at the lower ground level. If you are driving a car, there's one complimentary parking space available at the basement parking level. Parking space is guaranteed for every room. If you are arriving by taxi, either from the airport or from your home, you can have the taxi drop you off right at the doorstep of the front office. Entrance to the driveway is located at the back of the building, along Apartment Ridge Road. Check-in was very quick. 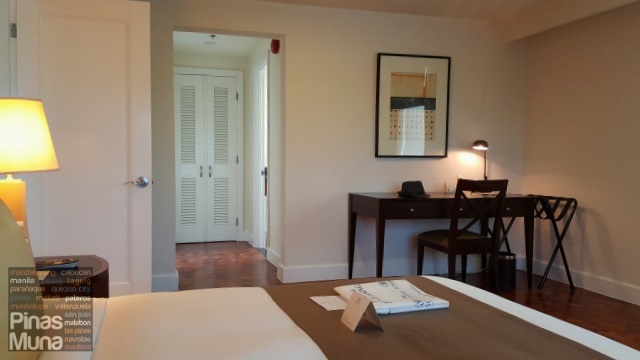 After signing the registration and paying an incidental deposit of only P500.00 per night, we were issued with our electronic keycards and assisted to our room by guest services. We stayed in a One-Bedroom Premier apartment (Room 91) located on the 9th floor of Tower C. It has a total floor area of 90 sqm, the biggest among the three subcategories of One-Bedroom apartments. The smaller ones are the One-Bedroom Deluxe (54-57 sqm) and the One-Bedroom Executive (67-73 sqm). The most basic room category is the Studio Executive measuring 26-36 sqm. The biggest room category, on the other hand, are the Two-Bedroom Deluxe (95 sqm) and the Two-Bedroom Premier (145-172 sqm). Our One-Bedroom Premier room has a spacious living area which is furnished with residential-style amenities such as a 3-seater sofa, a single seat sofa, a marble-top coffee table on top of a rattan rag. I also love the original Herringbone style wood parquet flooring which reminds me of houses built in the 70's and 80's including our old house where I grew up in Pasig City. The living area was already pre-cooled when we arrived, making it very easy for us to settle to our room. Somerset Olympia has a very homey vibe, it doesn't feel like you are staying in a hotel at all. It actually felt like we just moved in to a condo in Makati. It's the only property that I had this kind of connection, the real feeling of being at home. I think that is very important. I spent most of my time watching TV at the living area, exactly what I do at home on a weekend. My mom would have enjoyed the place as much as I did, I can imagine her sitting on her favorite rocking chair while watching her favorite afternoon shows. Next to the living area is the dining area. There's a round table which can seat four persons, ideal for a small family or a small group of friends. It's a great place to entertain visitors or host weekend dinners over home-cooked food or potluck. On our table are four jars of treats such as dried mangoes, pili nuts, cornick and banana chips. This reminds me of my tita's house that never run out of chips, candies and chocolates. Whenever we visit her house, we go straight to the dinner table to check-out what's inside the jars. You've got to check-out the view from the dining area. 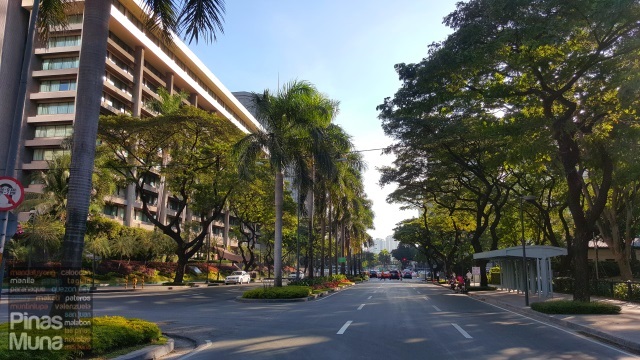 Rolling up the blinds gave us a view of Urdaneta Village, a high end residential area in Makati with lush trees and gardens. At the background are the skyscrapers of Bonifacio Global City. The bedroom is also generously spacious with the same warm and homey residential theme as the living room. It has its own air-conditioning unit and flatscreen TV with cable channels. Being located at one of the corners of the building, our bedroom had windows on two adjacent walls allowing sufficient natural light into the room. Our room had a king-size bed. The mattress had the right firmness enough to support the body in a flat position while the topper provided enough cushioning to adjust to the contours of the body. The bed is then covered with clean and crisp cotton top sheet. Adding more comfort was the duvet covered with high thread-count cotton cover. The pillows were fluffy and encased in clean pillow cases. Our bedside tables each had a lamp. There's also a writing table at one corner of the room. I did not bring my laptop that weekend so luckily, I didn't have to use the writing table. 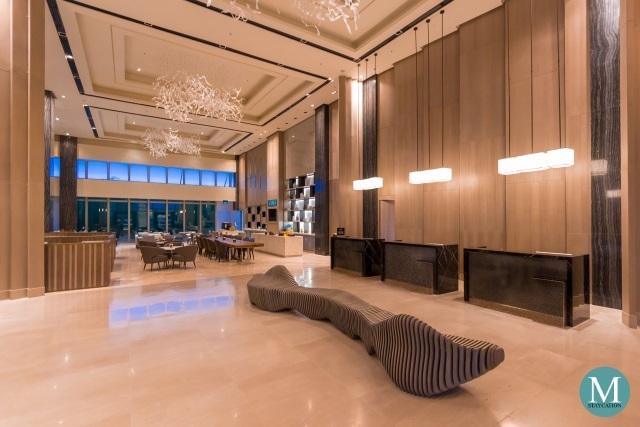 It is nonetheless an important feature of the room, especially for business travelers. Free WiFi Internet access is also available inside the room. The bedroom has so much floor space, more than enough for two persons to move around. The bedroom has a walk-in closet with very spacious storage space. There's also an electronic safe big enough to fit a 14" laptop. There's iron and ironing board as well, perfect for business travelers and leisure travelers. We didn't get to use the iron since we are just staying over the weekend and we won't be going out or attending social events anyway. 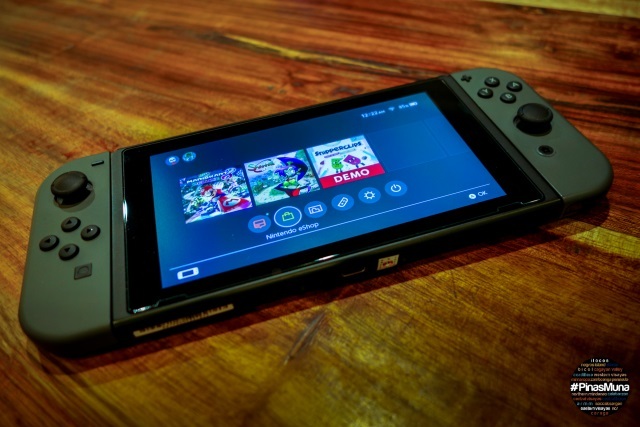 But it is still nice to have one just in case you'll need one. Next to the walk-in closet is the ensuite bathroom. It's a full bathroom with a single sink, a toilet and a bath tub with shower. The floor is lined with marble while the sink had a stone countertop. Water pressure was excellent and consistent, while the water heater works perfectly. Just like at Somerset Millennium Makati, Somerset Olympia Makati provides Bio Naturals branded toiletries such as Liquid Soap with Organic Lemon Oil, Hair & Body Shampoo with Organic Orange Extract, Softening Conditioner with Olive Leaf Extract and Lemon Essential Oil, and Caring Body Lotion with Olive Extract and Lemon Essential Oil. Bio Naturals is distributed by ADA Cosmetics, a Germany-based supplier of hotel cosmetics. One of the great things about staying in a serviced residence is the availability of a fully-equipped kitchen inside all apartments. Our room unit for example has a spacious kitchen with a lot of storage space and workable kitchen surface. There's a 2 door refrigerator where you can store your bottled drinks, fruits and packed meals. Nothing beats home-cooked meals. Good thing there's a cooker hob and hood where guests can cook or heat their own food. For staycationers, you can either bring pre-cooked food, store it in the refrigerator, and reheat during mealtime. You can also shop for your fresh ingredients and cook your meals during your staycation. Cooking you own meals is not only economical, it is a great opportunity to bond with family and friends. For long staying guests, another cost saver is washing your own clothes. 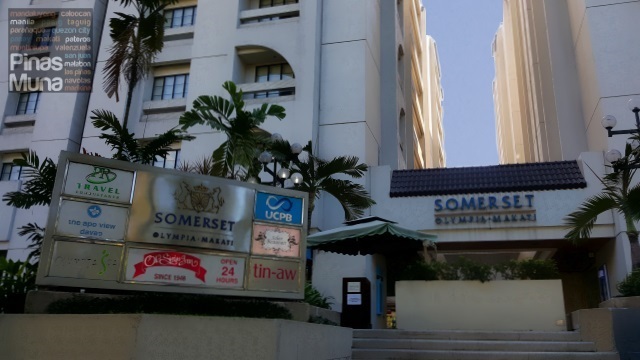 Somerset Olympia Makati also provides a washing machine for every apartment unit. Complimentary detergent powder is also provided. If cooking your own food (and washing the dishes) is not part of your ideal staycation, you don't need to go far. 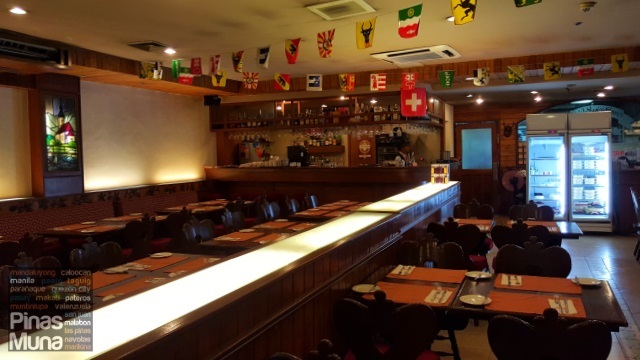 Located at the upper ground floor of Somerset Olympia Makati is the Old Swiss Inn Restaurant, a casual dining restaurant specializing in authentic Swiss and European cuisine. The Old Swiss Inn is one of the few restaurants in the area which is open 24 hours. Guests can either dine it at the restaurant or order food via room service. We decided to dine in at the restaurant and here are dishes we ordered for our three-course dinner. 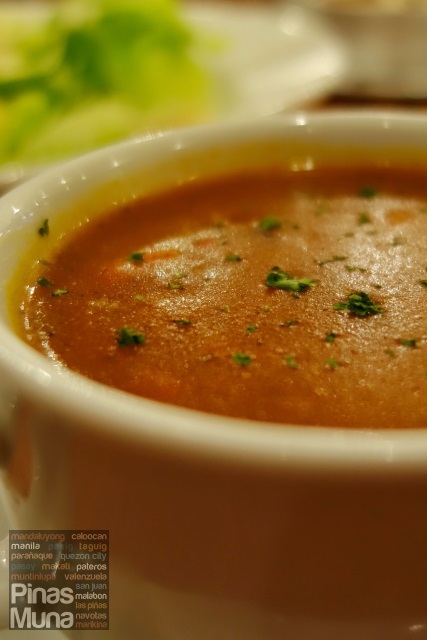 For appetizer, we had the Goulash (P225.00) a soup dish spiced with paprika which originated from Hungary and has become famous around Central Europe including Switzerland. It went well with the complimentary soft rolls served to us. We also ordered Classic Cesar Salad (P240.00) which had one of the best cesar salad dressing we tasted. The mesclun greens were fresh and crunchy and generously topped with bacon bits and grilled chicken strips. For the main course, we had the Chicken Forrestiere (P385.00) chicken is first grilled and then served with mushrooms and pepper gravy on a bed of buttered linguini. The chicken was very tender and moist. The gravy was heavenly delicious and I never imagined that linguini can actually go well with a gravy-based chicken dish. 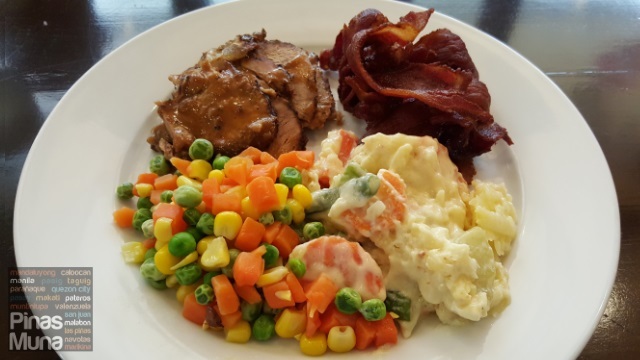 We also ordered Fresh Corned Beef (P435.00) which is freshly made in-house. The corned beef brisket was very tender that the meat just fall apart. It was served with sauteed cabbage which were crunchy and sweet. On the side are boiled potatoes. 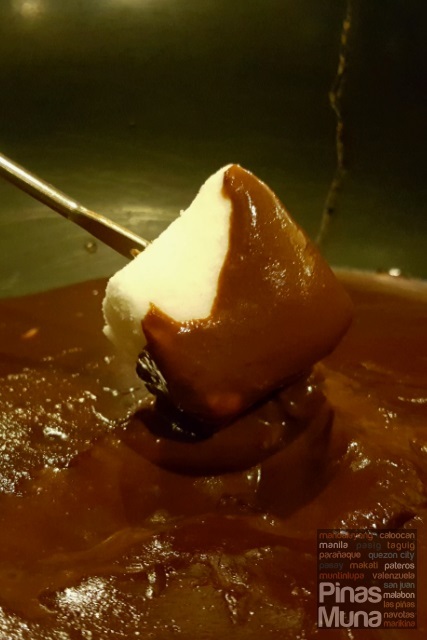 For dessert, we had the Classic Toblerone Chocolate Fondue (P430.00), an American classic made of 100% pure Swiss chocolate. We chose dark chocolate because we love the balanced taste of bitterness and sweetness of dark chocolate. 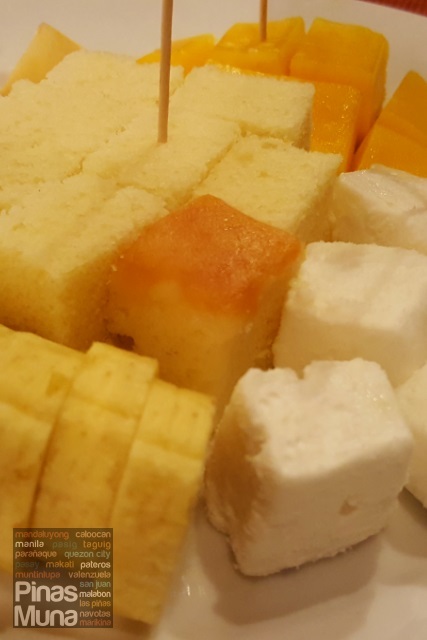 Served was a platter of sliced bananas, apples, mangoes, marshmallows and cubed sponge bread. For the ultimate relaxation, we had in-room massage service from Paradasia Royale Spa. 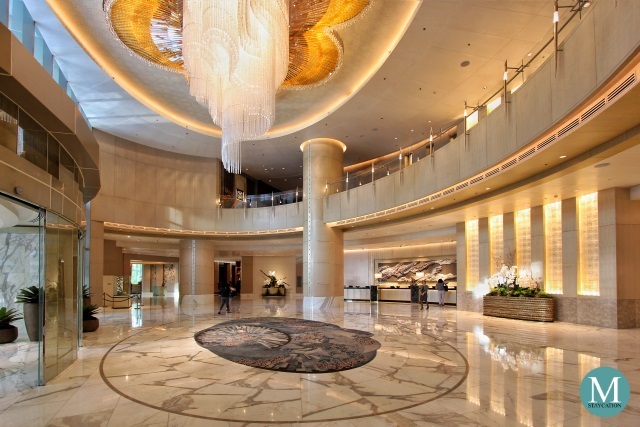 It is the same spa that services Ascott Makati, Ascott BGC and Somerset Millennium Makati. We had the 60 minutes Swedish Massage (P1,410.00). We have tried several spas around Metro Manila and we could say that the therapists from Paradasia were very well trained and experiences because they can adjust the pressure to your preference and they know the exact pressure points to focus on to relieve the stresses and muscle pains. After the massage, we had a quick warm shower and watched some documentaries and movies on cable. At 1:00am, it was time to turn off the TV and dim the lights. With a well relaxed body and comfortable bed, we literally felt like floating on clouds as we go to deep slumber. We had a long uninterrupted sleep. 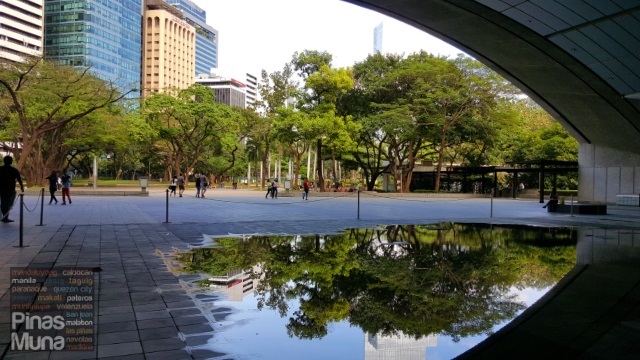 Feeling well rested and rejuvenated, it's time to jump-start our sleepy bodies with a morning walk at the Ayala Triangle Gardens. Warmed up and energized, we continued our morning workout at the fitness center located at the lower ground floor of Somerset Olympia. 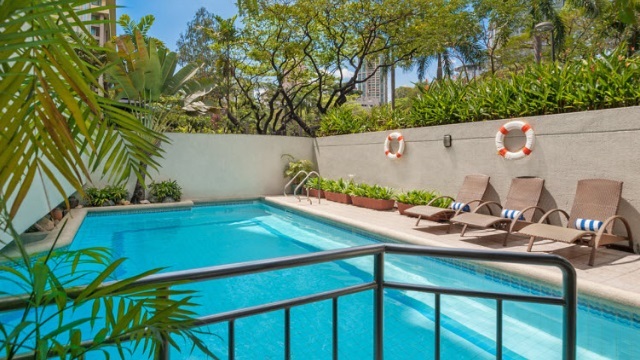 Somerset Olympia Makati also has a small swimming pool accessible from the fitness center. We skipped the swimming pool and went back to our room for a quick shower, getting ready for late breakfast. Our stay at Somerset Olympia Makati includes complimentary buffet breakfast for two at the Old Swiss Inn restaurant. The food selection is very limited, but well selected to cater to different diets and taste. There's continental as well as salads and fresh fruits. On the heavier side, there's bacon, roast beef, buttered vegetables, rice, potatoes and various breads and pastries. After breakfast, we went to Creations by Lourd Ramos Salon for haircut and scalp treatment. 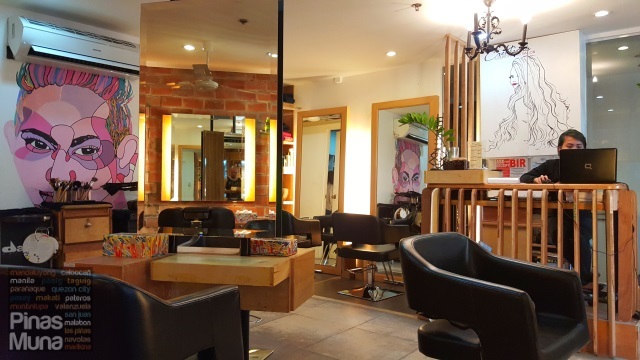 The salon is conveniently located at the lower ground level of Somerset Olympia Makati. The pampering started with a warm shampoo and followed by our usual haircut. After the haircut, we had another warm shampoo to remove the bits of hair that stick to the scalp. 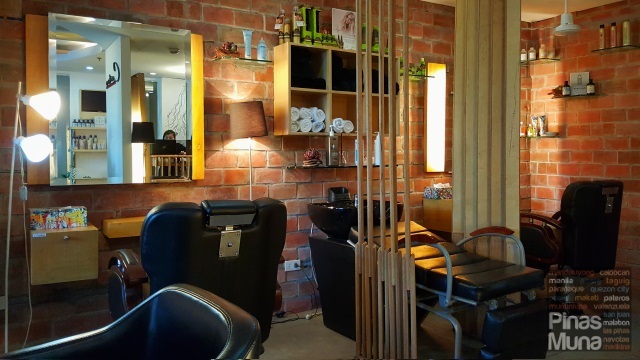 We were then ready for our scalp treatment which helps in preventing dandruff. The cream used was very refreshing and soothing to the scalp. After the scalp treatment, we also had a quick shoulder and head massage. What a great way to start the day! Before going back to our room, we requested an ocular of the other room categories at Somerset Olympia Makati. Fortunately, there are a few Studios and One-Bedroom Deluxe units available for viewing. We first viewed the Studio Executive room. Measuring 26-36 sqm., the studio is perfect for couples or solo business travelers. It has a kitchenette with mini-refrigerator, a microwave oven, cooker hob and hood. The ensuite bathroom has a bath tub as well. The One-Bedroom Deluxe is perfect for couples or solo business travelers who require more space and a full range of serviced residence amenities. Although smaller in size at 54-57 sqm, it still has a living area and a dining area with a fully-equipped kitchen. The bedroom is less spacious and so is the bathroom. I love laksa and because Edgar doesn't eat seafood, we ordered the Hainanese Chicken Curry Noodle (P368.00) instead. It was actually a good choice because it had the same spicy soup I was looking for plus the goodness of the Hainanese Chicken that Edgar loves. Edgar adores tofu so we tried their Sizzling Singapore-Style Hot Plate Tofu (P295.00). Edgar got all the tofu while I settled of the ground pork, shrimps and vegetables. I have always been curious about this signature Singaporean dish, so I ordered the Cashew Coffee Spareribs (P315.00). It was sweet, a bit spicy, with hints of oyster sauce and coffee. While eating, I actually search on Youtube how this dish was typically made in Singapore and I was surprised how easy it is. I'm gonna try cooking it at home, hopefully I get the taste right. We paired all dishes with a bowl of Wee Nam Kee Fried Rice (P250.00). 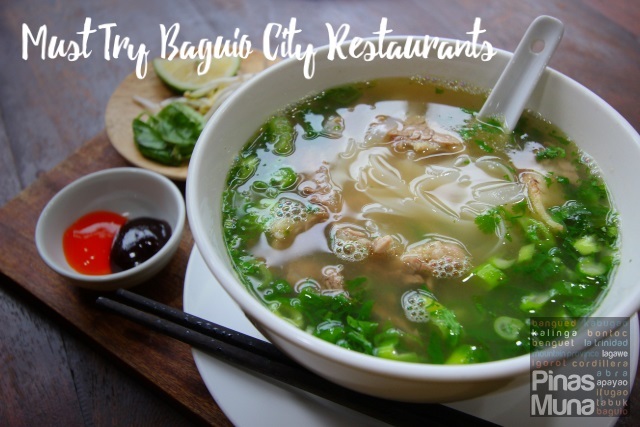 There's so much more we wanted to try from their menu especially their Classic Laksa, their signature Steamed Hainanese Chicken and Wee Nam Kee Chicken Rice. Wee Nam Kee definitely deserves a second visit! 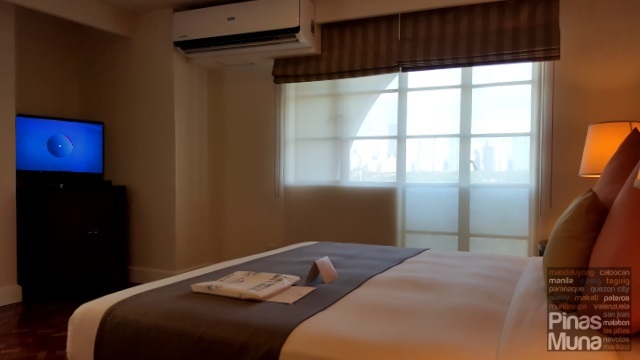 Overall, we had one of our most relaxing staycations in Makati here at Somerset Olympia. It is the only serviced residence that really made me feel at home. For once, I didn't feel like I was in a hotel. Somerset Olympia is one of the very few properties which I can call home. The room rates here at Somerset Olympia are some of the most affordable you can find, a real value for money considering the size of the rooms and its central location. 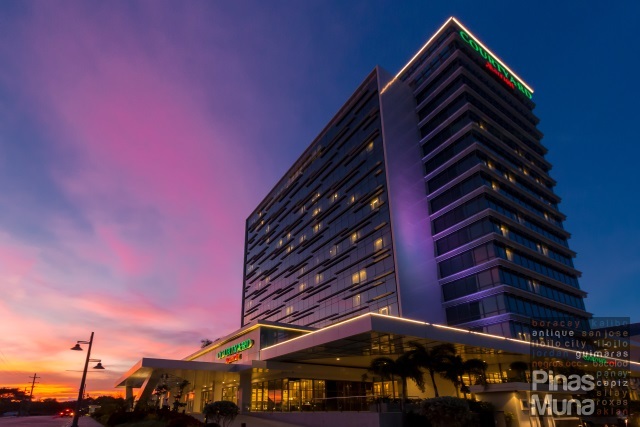 It's really a great deal for staycationers and business travelers. 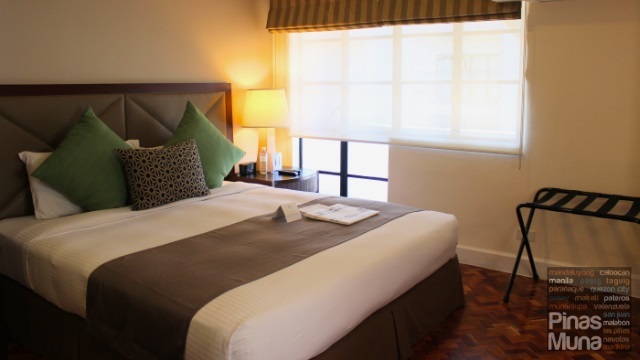 I am actually considering to book a Two-Bedroom Premier room for a barkada weekend staycation. Until our next visit, Somerset Olympia Makati! 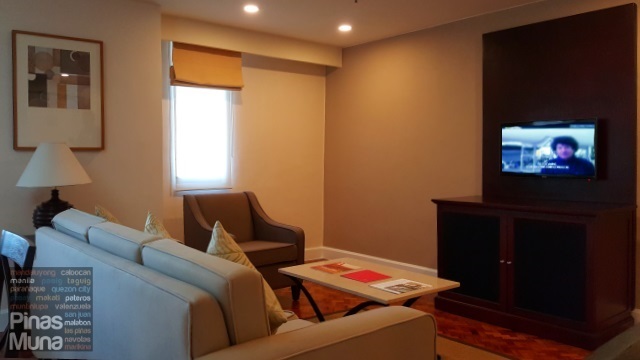 The use of this 360° virtual tour of Somerset Olympia Makati is authorized by Traveloka.